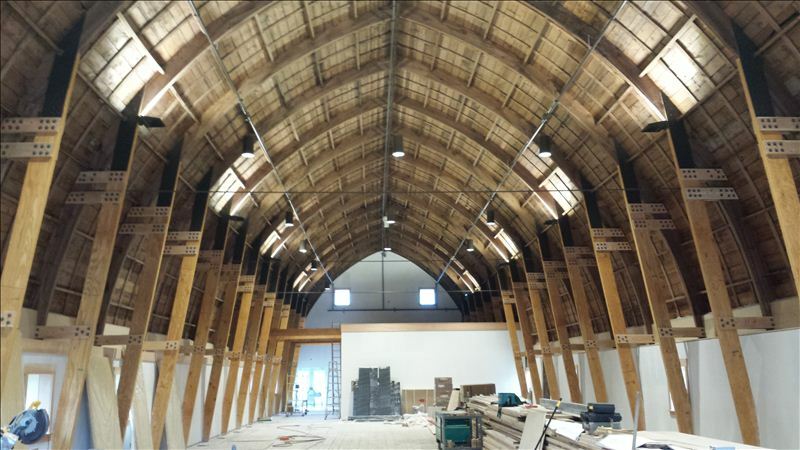 The selected contractor will help the Authority prepare for the opening of the Cathedral Barn as a public event space. The successful bidder will be contracted by the Authority to help prepare for the use of event facilities in the park, most prominently the majestic Cathedral Barn. Proposals are due on October 30 at 2 p.m. The Authority conducted a successful three-year fundraising campaign for Phase I construction work on the Cathedral Barn. That work is scheduled for completion before the end of 2014 and includes plumbing, electrical, geothermal heating and cooling, restrooms, and a kitchen space. The event facility management consultant will play an important role in the park’s continued development and use, as revenue derived from event rentals is necessary to support upkeep of the facilities themselves. Anticipated events include weddings, conferences, performances and public gatherings. Historic Barns Park is 56 acres of rolling meadows, woodlots and wetlands in the southwest corner of the Commons, a sea of green located in the heart of northern Michigan’s most populated urban center. The site was the agricultural production area for the former Traverse City State Hospital, feeding patients and staff from the 1880s into the 1950s. The site is still dominated in its center by its namesakes, two majestic barns that have come to be known as the Historic Barn (built in 1900) and the Cathedral Barn (built in 1932). In 2004, voters in Traverse City and the Charter Township of Garfield overwhelmingly approved a millage funding the purchase of the Barns site and two other properties for development into public parks, to be overseen by the newly formed Recreational Authority. The Recreational Authority is a joint municipal body governed by a seven-member citizen Board of Directors. The millage only provided the Authority with a very modest operating budget to be spread across all three properties. As a result, the Recreational Authority Board has always had to seek additional partnerships and sources of funding to improve and maintain the three parks. Guided by an extensive public visioning process and buoyed by broad community support, Historic Barns Park is being reborn as a one-of-a-kind public space with activities to promote agriculture, horticulture, arts, community events, recreation, and environmental sustainability. In 2010, the Recreational Authority completed a business plan that focuses on the sustainable use of the Barns as community facilities. As the operating millage for the Authority is insufficient to maintain large buildings, a facility rental enterprise was identified in the business plan as the most viable way to provide operating and maintenance income for the Barns within the parameters established by the public. The Cathedral Barn and an adjoining natural “amphitheater” space form the centerpiece of the Recreational Authority rental enterprise. A three-year fundraising campaign was initiated in 2010 to provide the funds necessary to renovate the Cathedral Barn for public use. That campaign has reached its Phase I target, and renovation work on the Cathedral Barn is scheduled to be complete in late 2014.